Battalion Headquarters of the 1st Middlesex Regiment has moved up to the southern edge of Glencorse Wood, where news of relief is awaited. But reports are slow in coming in, many of the guides losing their way in the crater area, while the enemy’s shell fire is increasing in intensity. ‘D’ Company is the first to report “relief complete,” but it is 23:40 before that news reaches Battalion Headquarters. For some hours no further news is received, all telephone wires having been cut by hostile shell fire. ‘A’ Company, which is in position before 22:00, is the last to report. The Company Commander has sent several orderlies with reports (other communication being impossible), and hours pass before at last one gets through. Eventually, by means of officer patrols, all companies are at 04:30 accounted for as being in position. Once in position, the two forward companies send out patrols and cover their fronts with a series of posts. The right sub-sector of the 33rd Divisional front is held by the 100th Infantry Brigade, whose line extends from the southern bank of the Reutelbeek southwards to the Ypres.-.Menin Road. The 5th Australian Division is on the left of the 98th Brigade. At approximately 05:30 a.m. the enemy begins a barrage on the front, support and reserve lines of the 33rd and Australian Divisions. Gas and heavy shrapnel are largely used. There is a thick morning mist when the bombardment opens, under cover of which and the fire of their guns, the enemy attack the Australians right, the Middlesex Regiment and the 100th Brigade south-west of Reutelbeek. Hidden by the thick mist and under cover of the merciless barrage his guns are putting down on the front, support and reserve lines the enemy advances at about 06:00. His troops, in considerable strength, swarm across No Man’s Land. The brunt of the first attack seems to have fallen on three platoons in the center and on the right of ‘B’ Company. Handicapped by the fact that they have never seen their front in daylight, and that the Yorks and Lancs, whom they had relieved, had been unable to give them very much information (that unit only having held the sector for about 24 hours), these platoons nevertheless hold their ground for some time. But, aided by their knowledge of the ground and (to them) the friendly mist, the German troops work their way through and between the posts and take them in rear. On the right, ‘A’ Company (and the 100th Brigade on their flank) is attacked from behind a small ridge in front. But with Lewis-gun and rifle fire the enemy is repulsed, and as his troops fall back they are subjected to a severe flanking fire. About 06:30 the enemy launches another attack. Five waves of Germans with support come on unhindered by a barrage which has been placed along the whole German front that morning by order of Second Army Headquarters. The attack comes from the direction of Jerk House. The first attack has cut a gap between ‘A’ and ‘B’ Companies, and through this gap the Germans, gradually closing in, work from shell hole to shell hole. Desperate fighting, much of it hand-to-hand, now takes place. ‘A’ Company is losing heavily, and eventually the enemy enters Veldhoek Trench from the left, bombing along it in a southerly direction. Finally, the remnants of the Company fall back about 150 yards. In the fighting the Company Commander Captain S. Preston is killed, along with Second Lieutenant T J Young, of ‘B’ Company, who was acting as liaison officer between the two Companies. All the officers of these two front Companies are either killed or missing. Remnants of both ‘A’ and ‘B’ Companies are now making their way back to the support line, where ‘C’ and ‘D’ Companies, unable to see owing to the thick mist and kept down in their trenches by the two heavy barrages and hostile machine-gun barrage, are unaware of what has been happening in the front line. But as soon as they learn the situation steps are taken to check the enemy’s advance. Lewis guns are pushed out to cover the gap in the center, and groups of men dash forward into shell holes. Now the enemy is met by fresh troops and at once they are checked. ‘D’ the right support Company, endeavoures to get into touch with the left of the 100th Brigade, but owing to the marshy ground fails to do so. The mist lifts and troops of the 100th Brigade are seen falling back, thus uncovering the flank of the Middlesex. In the distance the enemy in large numbers is observed crossing the ridge in front, and heavy fire is brought to bear on him. Once again his advance is checked. But all the while enemy aeroplanes, flying low over the Middlesex trenches, harass the Die-Hards with machine-gun fire. Battalion Headquarters has now received news that the enemy has penetrated the front line, and Major Hanley prepares his position for defence should the Germans break through the supporting companies. The situation is reported to 98th Brigade Headquarters, and the latter orders the Argyll and Sutherland Highlanders to place one company at the disposal of the O.C., 1st Middlesex. At about 08:00 this Company is in a trench behind Battalion Headquarters of the Middlesex. Soon a platoon from the Highlanders is sent to fill a gap between the right of the Australians and the left of ‘C’ Company (the left front company) of the Middlesex. At about this time a corporal staggers into Battalion Headquarters and reports that No. 6 Platoon of ‘B’ Company, under Sergeant Martin, is still holding on to its original position and is in touch with the Australians on their left. These men are on the extreme left of the Middlesex front line and, although exposed to frontal fire and enfiladed from their right, have refused to surrender and are clinging grimly, with extraordinary tenacity and courage, to their position. As soon as this information reaches the CO he sends a message to Brigade Headquarters asking for a barrage to be put down on that flank. Arrangements are being made to fill the gap between ‘D’ and ‘C’ Companies when orders arrive at Battalion Headquarters from Brigade Headquarters with details of an attack to be made in order to regain the original front line. The time is about 12:30. At 13:15 Battalion Orders for the attack are issued. The attack is to be made by the 1st Middlesex and ‘A’ and ‘C’ Companies of the Argyll and Sutherland Highlanders, to regain the lost line. ‘C’ Company of the Middlesex is to attack on the left on a front of 180 yards, ‘A’ Company of the Highlanders in the center on a frontage of 200 yards, and ‘B’ Company on the right also on a front of 180 yards. Three platoons of ‘C’ Company of the Highlanders are to support the attack and dig in 200 yards in rear when the original front line has been reorganised. Zero hour is to be 14:00. The situation of the 1st Middlesex when these orders are issued is that ‘D’ Company (right), with remnants of ‘A’ and ‘B’ Companies, and ‘C’ (left), are holding a support line roughly about 200 yards behind the original front line. There is a gap between these two Companies very thinly held by one or two posts some 50 to 80 yards apart. Orders to the Argyll and Sutherland Highlanders states that their ‘A’ Company is to advance on a front of 180 yards and endeavour to fill the gap, and when even with the Middlesex both Battalions are to advance to the original front line and consolidate it, afterwards pushing out posts to their front. The barrage starts well in front of the line held by ‘D’ and ‘C’ Companies of the Middlesex, the Highlanders having, therefore, to start without its assistance. ‘A’ Company of the latter Battalion leaves the ‘jumping-off’ line at 13:55, followed at 200 yards distance by ‘C’ Company. The whole movement is, visible to the enemy, who puts down a heavy barrage in front of the attack. In spite of the barrage the Highlanders push on and come up even with the Middlesex. By now a hurricane of machine-gun bullets sweep the entire line and neither the Middlesex nor the Highlanders can move. They therefore consolidate their ground, forming again a continuous line across the Brigade front. A message, despatched to Battalion Headquarters, asking for a further barrage, does not reach its destination. In the meantime the consolidation proceeds. Towards evening the Germans again advance and heavy fire is opened upon them. The enemy, however, occupies some concrete emplacements on the right center of the line and put up Red Cross flags. As they are observed strengthening their position no notice is taken of the flags, and both Middlesex and Highlanders keep the enemy under heavy fire. Lieutenant Colonel William Rae Brakspear (commanding 3rd Gurkha Rifles) is killed at age 49. Captain Anthony Herbert Sharpe (Liverpool Regiment) is killed. He is the son of the Reverend William Robert Sharpe Vicar of Little Barrington. Captain Alan Estcourt Boucher (Leicestershire Regiment) is killed at age 21. He is the son of the Reverend Charles Estcourt Boucher Rector of Frolesworth. 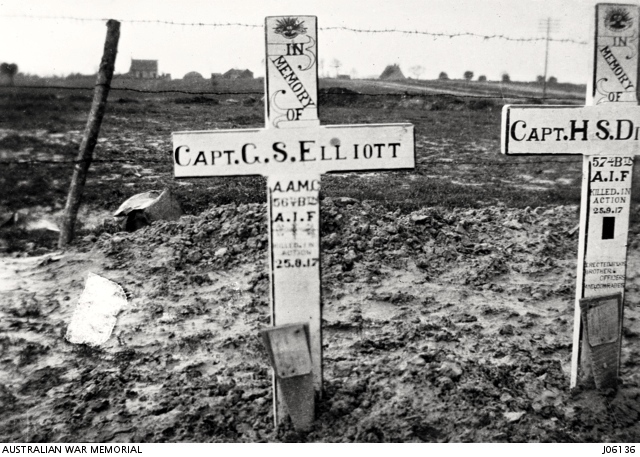 Captain George Stephenson Elliott MC (Australian Army Medical Corps) is killed at age 32. The Australian Rules Footballer scored 3 goals in 80 games as a defender. He is the brother of Major General Howard Edward Elliott who will suffer from what is now called post-traumatic stress disorder, which will lead to his suicide in 1931. Second Lieutenant Arthur Johns (Royal Engineers) is killed. His brothers were killed in the last two years. QMS Edward Kennett Budd (Royal Engineers) dies in Calais at age 47. His brother-in-law Private Percy G Viney (Grenadier Guards) is killed in action the same day. Corporal Charles Botcherby (West Yorkshire Regiment) is killed at age 35. His son named after him will be killed in April 1944 and they are the only Botcherby’s who are killed in the military in the World Wars. Corporal Percy Turvill (Sussex Regiment) is killed. His brother was killed in December 1915 at Salonika. Private Albert Edward Tarrant (Australian Machine Gun Corps) is killed in action at age 20. His brother was killed in November 1915. Private Francis Maurice Prentice (London Regiment) dies of wounds at age 24. He is the eldest of three brothers who will lose their lives as a result of Great War service. The first will be killed in November of this year, while the second will die in 1920 at age 21. Private Harold Newnham Tompkins (Australian Infantry) is killed. He is the son of the Reverend Herbert Chilton Tmpkins Rector of East Woodhay. Private Charles Alexander Allen (Australian Infantry) is killed at age 29. His brother was killed on the first day of the Gallipoli landings. Private Winstaley Carlyon-Britton (Leicestershire Regiment) is killed while acting as runner to an advanced post at age 30. He is the eldest son of Major Philip William Poole Carlyon-Britton DL JP. Private Carlyon-Britton was gazetted Second Lieutenant in the Royal Fusiliers (City of London Regiment) Special Reserve in 1908 and joined Dublin Fusiliers in 1910, being promoted Lieutenant in 1911. He resigned his Commission in 1912. In September, 1914 he was appointed temporary Second Lieutenant in the Worcestershire Regiment, but was invalided out early in the War and totally exempted from further service. After many months’ rest he decided he ought to try and serve again, and not feeling sure how far the improvement in his health was permanent he decided to enlist as a private, and not try for a commission again for a time. He therefore, in November 1916 enlisted in the Leicestershire Regiment and went to France in February. He has just been recommended by his Colonel for a commission.